Designed specifically for 65mm and 85mm Razor HD spotting scopes, the fixed-magnification Vortex Optics Long Eye Relief 18/23x Eyepiece is engineered with an exceptionally long 31mm eye relief to bring the user's eye comfortably away from the scope for easier observation. To maintain the image quality when installed in the spotter, Vortex matched the extra low-dispersion lens glass, fully multi-coated it with their XR anti-reflection coatings, and utilized the same protective ArmorTek lens coatings. It is also argon-filled and O-ring sealed for water and fogproof performance in even the harshest conditions. When used on the 65mm Razor HD it yields 18x power and in the 85mm Razor HD it produces 23x. This eyepiece will not work on the 50mm Razor HD models. Box Dimensions (LxWxH) 4.95 x 2.3 x 2.15"
Will this work on the Vortex Razor HD 27-60x85 spotting scope? Yes the Vortex Long Eye Relief 18/23x Eyepiece for Razor HD Spotting Scopes works on the 18x with 65mm Razor HD and the 23x with 85mm Razor HD. 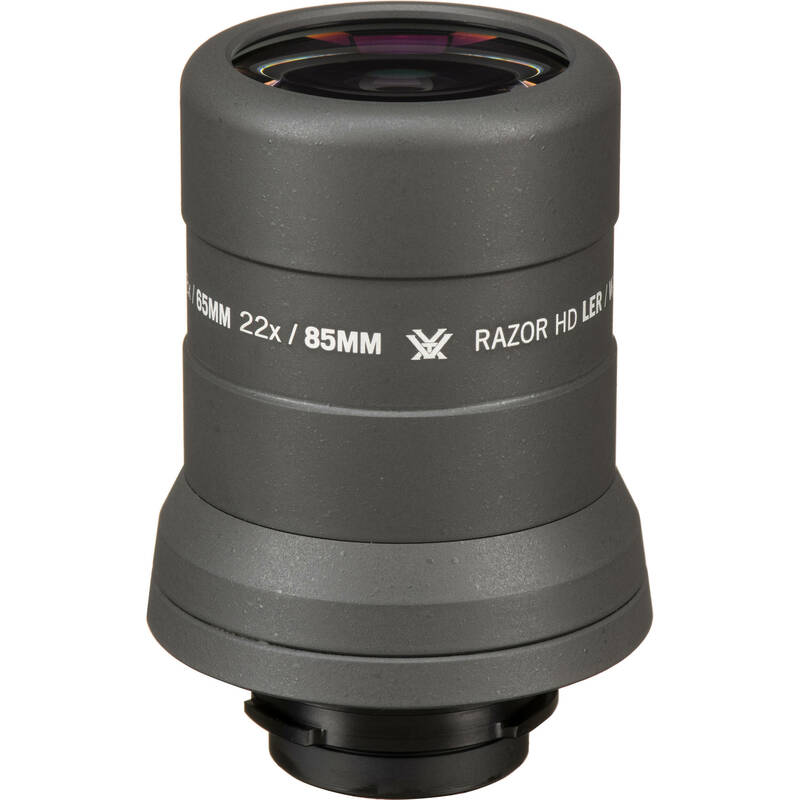 What is the exit pupil diameter (mm) for this eyepiece on the Razor 27-60x85 spotting scope? The Vortex Viper look exactly like the Athlon Ares 20 X 60 85 mm. Wil this Eyepiece work on the Athlon? It seems they are the same scope under different brand. I bet they use the same bayonet. Sorry, I just dont know.